: Herding dog used by Romanian shepherds in the Carpathian mountains for centuries to defend the herds while, at the same time, being an excellent guard dog. 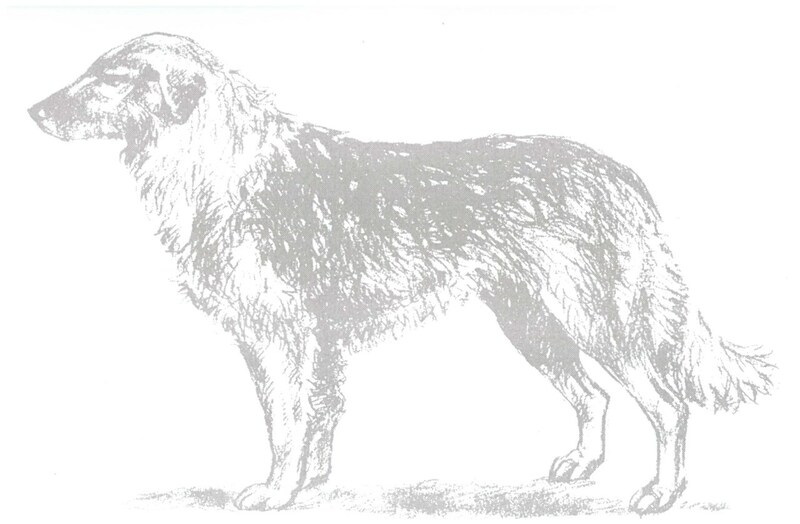 : The Romanian Carpathian Shepherd Dog was selected from an endemic breed present in the Carpatho-Danubian area. For centuries the principle criteria for selection has been utilisation, this dog having conserved its character intact to the present day. : Relatively large-sized dog, agile, never heavy, the general appearance being that of a vigorous dog. The body is rectangular, the croup is broad, slightly sloping, the chest is large and deep, the shoulder long and slightly sloping. Sexual dimorphism is well defined, the males should be taller and stronger than the females. The length of the skull is slightly greater than or equal to half of the total length of the head. The length of the body is always greater than the height at the withers. In females, the lumbar region may be a little longer. The depth of the chest corresponds more or less to half of the height at the withers. : A natural guardian and courageous, he distinguishes himself by his instinctive and unconditional attachment to the herd and his master. He is a dignified, calm and stable dog. : The Carpathian Shepherd Dog is of the mesocephalic type, with a powerful but not heavy head. The forehead is wide and slightly domed; wider between the ears and narrowing progressively towards the stop. The frontal furrow is relatively long and sufficiently well defined. : Moderate, never too pronounced nor too discreet. : Large, wide and always black. : Powerful, of approximately oval section, slightly truncated cone shaped. The length of the muzzle is slightly less than or , at the most, equal to that of the skull. : Thick, well pigmented, tight and well closed at the corner of the mouth. : Strong, solid and straight jaws. Powerful dentition; scissor bite with the incisive arcades slightly rounded. : Lean, with strong but never prominent cheek muscles. The skin is tight. : Almond shaped, slightly oblique, not too big compared to the size of the skull, colour dark brown. Neither protruding nor sunken in the sockets. The eyelids are black, tightly fitting the eyeball. : Not too big, triangular, attached a little higher than the line of the eye, with the tip slightly rounded, carried close to the cheek. : Muscled, very strong, of medium length presenting an angle of approximately 50° to the horizontal. : Vigorous, well developed, slightly rectangular. : Of moderate length, straight, solid and muscled. : Powerful, muscled, but not too broad, of moderate length, neither too long (the topline would not be firm enough) nor too short. Croup Broad and muscled, of moderate length, slightly sloping, never falling away. : Well developed, deep, reaching to the elbows, relatively wide. Strong ribs, well sprung, never barrel like. : Moderately rising, belly tucked up but never drawn in nor pendulous. : Set on relatively high, bushy, with abundant coat. At rest, it is carried low, straight or slightly sabre-like, reaching to the hock. When the dog is alert or in action, tail is carried upwards and can be even higher than the topline but never lying on nor curled over the back. Seen from the front or from the side, upright and perpendicular to the ground. : Close to the body, neither in nor out. : Straight, very vigorous, with an oval section. : Oval, well developed and compact, a speck smaller than the front. Toes arched and tight. Dewclaws, if any, should be removed except in countries where their removal is forbidden by the law. The pads are resilient and resistant. : Upright. Muscled with strong bones and good angulation. : Powerful, muscled, of moderate length. : Solid, firm, neither too high (indicating an accentuation of the stifle angulation) nor too low. : Free, long-reaching movement. Vigorous and sustained trot. In action, the limbs are parallel. : Ash grey pigmentation. The nose, the eyerims and the lips should be black. Ash grey or black preferred for the nails. : The coat is harsh, dense and straight. The undercoat is dense and soft. With the exception of the head and the front part of the limbs where the coat is short and flat, the coat, of moderate length, is abundant all over the body. On the neck, the back of the limbs and the tail, the coat is longer – profuse coat on these parts being typical. Male Ideally 65 – 73 cm at the withers. Female Ideally 59 – 67 cm at the withers. However the overall impression is always more important. : In harmony with the size, giving the impression of a powerful but not heavy dog. Any departure from the preceding text and which hinders utilisation. Weak or too heavy construction. Eyes too light in colour. Very drooping lower eyelids, showing the eyeball, lips too fleshy and drooping commissures. Excessive length of body (more than 10%) and square body. Aggressive, overly shy or lethargic. Subject clearly untypical with molossoid type appearance. Absence of a P3 and another tooth, absence of a canine, absence of a P4, absence of a molar or absence of three or more teeth (except PM1). Overshot, undershot or level bite. Lack of undercoat, coat other than short on the head and front of limbs, curly or bushy coat, wire coat, long coat, limp coat, silky coat, forming a distinct parting along the spine. Important lack of pigmentation of eyelids, the nose, the skin and the lips; wall eye. Colour brown, brindle, yellow, or flecked in these colours. Males less than 62 cm, females less than 58 cm.